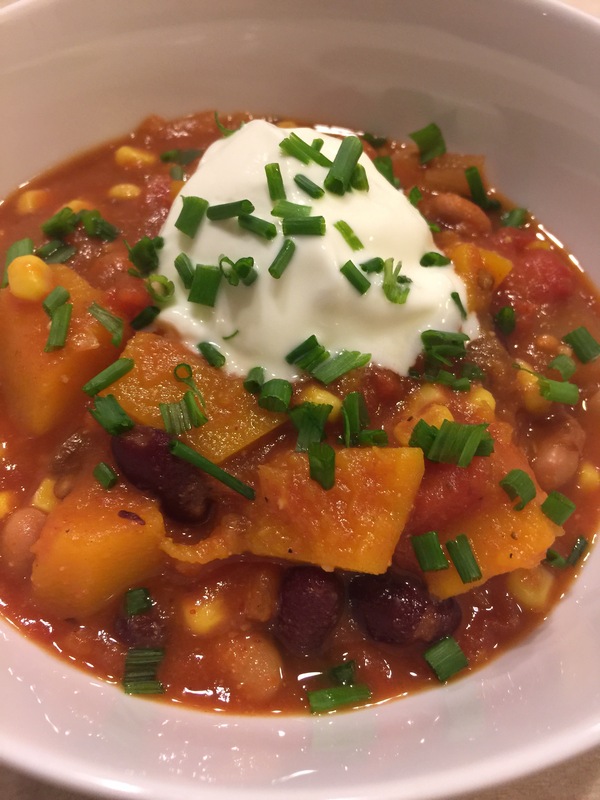 Crockpot Butternut Squash Chili – A Vegetarian Recipe Everyone Should Try – Abbey Co. I have always enjoyed eating vegetarian meals, simply because often times I feel like they turn out much healthier. Seriously, when have you ever had a vegetarian meal that was smothered in cheese and gravy? It just doesn’t happen. However for that reason I feel that vegetarian cooking has a bad reputation – that eating strictly vegetables means the meal wont be hearty, filling, or delicious. This recipe totally puts all those myths to bed, and is a much healthier but equally delicious way to do chili. The first time I fed it to my husband he admitted that it was so flavorful that he wouldn’t have known it was sans-meat if I hadn’t disclosed it (note to self people making this for picky/skeptical eaters… maybe let them try it before admitting you left out the beef 😉 ). Dice all your veggies, then toss everything into the crockpot. Cook on high heat for 4 hours. When dish is ready to serve, it should be red and thick, not having lots of liquid broth visible. Dish up, and garnish with a tablespoon of sour cream and some diced chives. Leftovers can be stored in freezer bags to be enjoyed later if desired!